Stop squirming, there – have you no self respect? Just lean back into the straps, bite down – HARD! – on this leather strap, and let me finish this up before dinner. And stop being such a silly goose. It’s for SCIENCE. 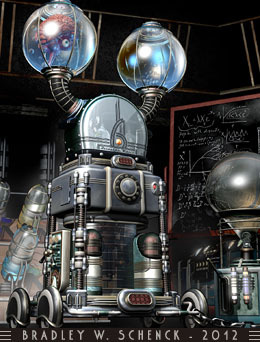 It can be so irritating, dealing with those experimental subjects who, all right, might not have volunteered, as such, to further the goals of science. Half the time they seem to start out as door to door salesmen and meter readers. But whatever their origins, is it too much to ask that they should just lie there quietly while you attach the electrodes? That’s very delicate work, there. They ought to be a little more appreciative. That’s all I’m saying. So for all of those times when the world doesn’t seem ready to capitulate to your plans for universal vivisection, or mass miniaturization, or even widespread liquefaction, I submit for your approval this instructive image, on T-Shirts, coffee mugs, posters, and other inspirational materials. 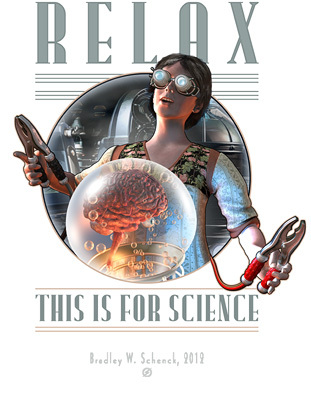 Relax: This is for SCIENCE! The Answer is ‘Coffee’. The Subject of Your Question is Immaterial. You may have discovered that, when it comes down to it, only a very small percentage of the questions people ask you are significant. That’s not surprising, really; what is surprising is that recent empirical testing has revealed that every one of those questions can be answered with the same word. That word is "Coffee". The subject of the question, it turns out, is immaterial. 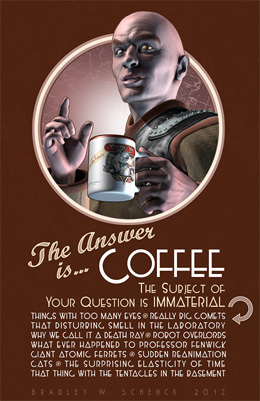 The answer, always, is "Coffee". So in this design for posters and T-shirts for Retropolis I have supplied a helpful list of subjects that you might be asked about in the course of a typical day; topics like "That Disturbing Smell in the Laboratory", "Why We Call It a Death Ray", "Giant Atomic Ferrets", and so on. Chances are that any question you’re asked will fall into one of these categories and now, armed with this shirt or poster, you can simply point rather casually to that subject in the list, and indicate your coffee mug, which possibly is empty, and hey presto, you’re done. Because Coffee is the answer to all of life’s little peccadilloes and problems, including the problem of when you’ll ever be able to use the word "peccadilloes" in a sentence. 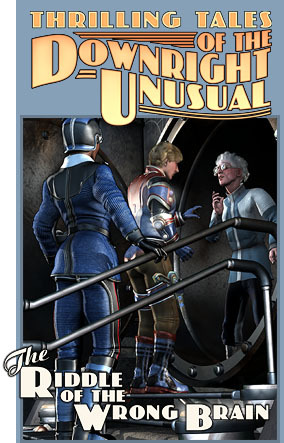 I’ve continued to think about the future of Thrilling Tales of the Downright Unusual since my last post about its troubled state. Well. When I say "its troubled state" I may be thinking about mine; but since the state of Thrilling Tales is dependent on my own state I guess that still works, whichever way you look at it. 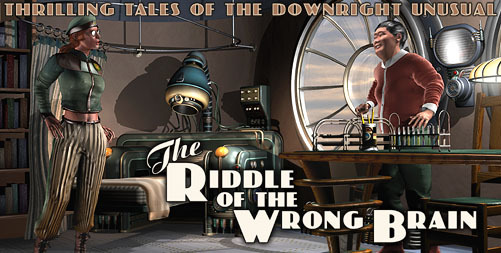 Today I’m ignoring the question of serials and I’m looking instead at The Riddle of the Wrong Brain, Part Two of The Toaster With TWO BRAINS. I’ve experimented with crowdfunding twice. The first time, I tried what I think is one of the worst Kickstarter pitches ever: "Give me money, and I’ll do what I was going to do anyway". Now that’s salesmanship. To my own surprise that fundraiser met its goal. But of course the goal was a fairly modest one. The second time, earlier this year, I launched what I thought was a pretty good fundraiser, and its pitch, according to me, was perfect: "Give me enough money, and this thing will exist. If you don’t, it won’t." That drive was also, narrowly, successful, but I was surprised to find that it got some criticism because its rewards were almost completely limited to the object – a limited hardcover edition of The Lair of the Clockwork Book. There were pretty good reasons for that: the book itself was expensive to produce, I faced a minimum order to get even that price for my print run, and the cost of any other rewards would have come out of the money that was needed for the edition itself. Adding a bunch of other rewards would have drastically increased the amount I had to raise. So I didn’t add them. What I found was that a kind of Kickstarter culture had been trained by big projects with stretch goals, bells, whistles and hoopla, all of which are brilliant and gamelike marketing strategies that have nothing to do with the core idea of a Kickstarter project, which is: "Give me enough money, and this thing will exist. If you don’t, it won’t." While that second Kickstarter project was successful, it didn’t make any money for me. All of its funding was needed in order to create what I think is a really nice archival edition of the book. I wanted it to exist; it was too expensive to produce on my own; and now it exists. The backers and I made that happen. But no, it didn’t make me any income. In fact it may have cost me something because the people who backed the project might otherwise have bought the paperback edition, which does make me money. This explains something important about my business sense. It’s missing. I don’t regret anything about that. I wanted this beautiful edition to exist, and now it does. For a lot of reasons I think more about legacy than I used to and this archival edition of The Lair of the Clockwork Book is a kind of legacy. So my Kickstarter experience has been complicated and interesting. That first Thrilling Tales fundraiser was a terrible example ("Give me money and I’ll do what I was going to do anyway"). No one objected! The second project, I thought, was a very typical one because it was a simple pre-order for an edition that wouldn’t otherwise exist; but there were those who objected to it, in private correspondence and even in completely unrelated places on the web. It’s a funny old world. Once the hardcover Clockwork Book was out there I wasn’t too excited about trying crowdfunding again. But I have been thinking about it lately, and here’s why. Unlike Kickstarter, IndieGoGo offers a flexible kind of funding that doesn’t follow the all-or-nothing Kickstarter model. A project isn’t required to meet its funding goal: if it uses the "Flexible" project type then its pledges are redeemed whether or not the project’s goal is met. That makes it possible to create a hybrid of my first Kickstarter project and my second, a project that would provide some funding for my ongoing work on Thrilling Tales, but which – only if the funding crosses a certain threshold – could also become the pre-order for an upcoming book. This model would give me a lot more freedom in creating the rewards, which up to that threshold would offer only existing merchandise: there would be no risk to the backers. Up to the threshold, all rewards would be available immediately. Then if the threshold is crossed there would be additional rewards of the paperback edition of Part Two of The Toaster With TWO BRAINS, which would ship much later, of course. If we never met the threshold, the backers would get their rewards and I’d have a nest egg that would still help me to complete The Riddle of the Wrong Brain. If we did meet the threshold, well, I’d be able to complete that book in relative comfort and the backers who selected the new book as a reward would get it as soon as it was finished. So we’d still be without an ongoing serial, but we’d be a lot more likely to see The Riddle of the Wrong Brain in the nearish future – around April or May of next year. It’s an interesting idea. Now one problem is that all the rewards up to that stretch goal might be things that my existing readers already have (the paperback books, bookmarks, some of the prints or t-shirts, and so on) and that might make it all the more difficult to reach the stretch goal unless there was a pretty large influx of new readers. That happens, by the way: a crowdfunding drive is in itself a form of promotion. But it could make it more difficult. Still, since the project would not fail even if we missed the goal it could still be worth a try. Crowdfunding projects can take an awful lot of time and work, and I wouldn’t start a new one casually. But: it’s a thought.